All shops want to grow, but what does growth mean to your shop? How does your team measure it? Choosing what metrics to track in your automotive repair shop can be tricky. Key performance indicators (KPIs), like average repair order and labor costs, are important to track for a better understanding of your shop’s growth. In this article we discuss how to track growth for your auto repair shop so your team can understand its strengths and weaknesses. What KPIs Should Auto Repair Shops Track? How many repair orders is your shop completing in a day? Knowing the amount of ROs your shop completes on a daily, weekly, or monthly basis gives you a foundation for measuring trends. More repair orders do NOT always mean wider profit margin, but it does identify a key metric in understanding growth for your shop. What is the average cost of a repair order that comes through your shop? Capitalizing on each vehicle that comes through your shop is a good way to raise your bottom line. Maximizing every repair order by upselling recommended services will translate into a higher average repair order and higher profit margins. How much time are your employees spending on each job? This is a great way to make sure you aren’t losing profit on jobs. Measure the efficiency of each of your technicians and their work to boost your bottom line and make a profit. By tracking billable hours, you can make sure your team is spending the appropriate amount of time on jobs. Your gross sales are the grand total of all transactions within a given period. This number helps to see the value of all products and services sold before any deductions are taken into account to get a complete overview of all the financial transactions going on in your shop. Gross sales are an important part of calculating your gross profit. Gross profit is the number that truly shows the health of your business. If your expenses and overhead are more than your sales, your shop is not profitable. Profit is what your shop makes after deducting the costs associated with providing its services. This tells you how successful your shop is and how much you’ve grown year over year. Be sure you’ve set your shop up for long-term success. Our dashboard allows shop owners to set goals for their shop, see the status of those goals in real-time, and identify areas to improve, all on an easy-to-read dashboard layout. At a glance, you can see what you are doing well and where your shop is struggling. Our auto repair software is customizable, so you choose what KPIs you want to track. BOLT ON takes it one step further and allows you to see how your shop is performing in comparison to your competition. In an industry as aggressive as automotive repair, it's important to know that your shop is maintaining a competitive edge. With our auto shop reporting software, everything is automated! No more entering in daily numbers and sales manually. Count on all your shop data within the shop management system to automatically integrate with our dashboard to report real-time results. 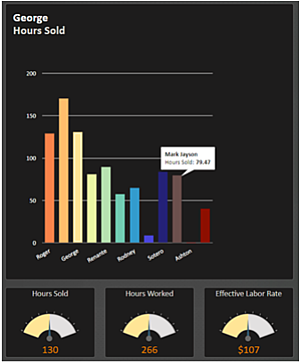 Learn more about how our dashboard will maximize your shop’s performance and efficiency today! Our team of friendly and helpful support techs will walk you through all the amazing features of our software and pay special attention to the individual needs of your shop.